Functions relating to ancestry of particles. Relations to the Event and Step. Access the underlying ParticleData object. Functions to access the momentum. Functions to access the position. Functions controlling possible mass/momentum inconsistencies. Set the order-number for this particle in the current event. Remove the given particle from the list of children. Remove the given particle from the list of parents. Set the mass of this particle. Set the invaiant life time of this particle. The pointer to the ParticleData object. The rest of the information in this particle is only instantiated if needed. The ClassTraits<Particle> class must be a friend to be able to use the private default constructor. The Particle class is used to describe an instance of a particle. Properties of the corresponding particle type can be accessed through a pointer to a ParticleData object. A Particle object contains pointers to other particles, such as a list of parents and a list of children. It may also contain a pointer to the previous or next instance of the same physical particle if the properties of a given particle has been changed during the generation. Coloured particles contains pointers to ColourLine defining the colour connections to other particles. 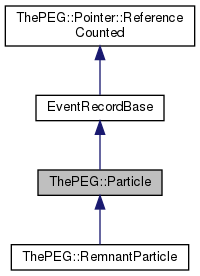 The Particle also has a pointer to the Step object where it was first introduced in the Event. %C sets a flag so that subsequent output of children and parents etc. will contain colour information. %Vx, %Vy, %Vz, %Vt is replaced by the x-, y-, z- and time-component of the creation point relative to the vertex of the collision. %Lx, %Ly, %Lz, %Lt is replaced by the x-, y-, z- and time-component of the creation point in the current lab-system. %v is replaced by the number of the next instance of the same physical particle. Definition at line 83 of file Particle.h. Note that the default constructor is private - there is no particle without a pointer to a ParticleData object. Definition at line 107 of file Particle.h. Create a colour line connecting to it this particles colour and the given particles anti-colour. Definition at line 741 of file Particle.h. Definition at line 817 of file Particle.h. Get a pointer to the anti-colour neighbor. Returns a particle in the range first to last which anti-colour is connected to the same line as this particles colour. Definition at line 720 of file Particle.h. Connects the given particles anti-colour to the same colour line as this particles colour. Definition at line 735 of file Particle.h. bx, by and bz are the boost vector components. Definition at line 500 of file Particle.h. b is the boost vector. Definition at line 508 of file Particle.h. References rotate(), rotateX(), rotateY(), rotateZ(), and transform(). Create a colour line connecting to it this particles anti-colour and the given particles colour. If anti is true call antiColourConnect(tPPtr). Definition at line 750 of file Particle.h. Definition at line 810 of file Particle.h. Get a pointer to the colour neighbor. Returns a particle in the range first to last which colour is connected to the same line as this particles anti-colour. If anti is true return antiColourNeighbour(). Referenced by antiColourNeighbour(), colourConnect(), and colourInfo(). Connects the given particles colour to the same colour line as this particles anti-colour. If anti is true call antiColourNeighbour(tPPtr). The decay vertex of this particle. The point is given relative to the collision vertex. Definition at line 424 of file Particle.h. Definition at line 545 of file Particle.h. Definition at line 553 of file Particle.h. References deepRotate(), deepRotateX(), deepRotateY(), deepRotateZ(), and deepTransform(). If there exists another subsequent instance of this particle return this instance (recursively). Definition at line 231 of file Particle.h. Definition at line 239 of file Particle.h. True if this particle has colour information. To determine if this particle is actually coloured, the coloured(), hasColour() or hasAntiColour() methods should be used instead. Definition at line 620 of file Particle.h. References hasRep(), rep(), and ThePEG::Particle::ParticleRep::theColourInfo. Referenced by antiColourLine(), colourLine(), hasColourLine(), and resetColour(). Return the parent particle which anti-colour is connected to the same colour line as this particle. Definition at line 766 of file Particle.h. Connect this particles anti colour to the same colour line as the given particle. Definition at line 779 of file Particle.h. Return the parent particle which colour is connected to the same colour line as this particle. If anti is true return incomingAntiColour(). Referenced by colourConnect(), and incomingAntiColour(). Connect this particles colour to the same colour line as the given particle. If anti is true call incomingAntiColour(tPPtr). Definition at line 773 of file Particle.h. The absolute position in the lab is given. Definition at line 432 of file Particle.h. The creation vertex of this particle. Referenced by labDecayVertex(), and vertex(). Return the Lorentz vector connecting the creation to the decay vertes. Definition at line 440 of file Particle.h. References hasRep(), rep(), and ThePEG::Particle::ParticleRep::theLifeLength. Referenced by decayVertex(), labDecayVertex(), and lifeTime(). Pointer to another instance of the same physical particle in later steps. Definition at line 198 of file Particle.h. References hasRep(), rep(), and ThePEG::Particle::ParticleRep::theNext. If there exists another previous instance of this particle return this instance (recursively). Definition at line 214 of file Particle.h. Definition at line 222 of file Particle.h. Return the daughter particle which anti-colour is connected to the same colour line as this particle. Definition at line 792 of file Particle.h. Connect this particles anti-colour to the same colour line as the given particle. Definition at line 805 of file Particle.h. Return the daughter particle which colour is connected to the same colour line as this particle. If anti is true return outgoingAntiColour(). Referenced by colourFlow(), incomingAntiColour(), and outgoingAntiColour(). Connect this particles colour to the same colour line as the given particle. If anti is true call outgoingAntiColour(tPPtr). Pointer to another instance of the same physical particle in earlier steps. Definition at line 206 of file Particle.h. References hasRep(), rep(), and ThePEG::Particle::ParticleRep::thePrevious. Print particle info to a stream os. The step is used to access information about colour neighbors and other struff. When an Event is cloned, a shallow copy is done first, then all Particles etc, are cloned, and finally this method is used to see to that the pointers in the cloned Particle points to the cloned objects. Return a reference to the bulk information of this particle. if no ParticleRep object exists, one is created. Definition at line 987 of file Particle.h. References hasRep(), initFull(), and theRep. Referenced by addChild(), birthStep(), children(), colourInfo(), decayed(), decayMode(), getInfo(), hasColourInfo(), lifeLength(), lifeTime(), next(), number(), parents(), previous(), removeChild(), removeParent(), resetColour(), scale(), setLifeLength(), setVertex(), spinInfo(), undecay(), vertex(), and vetoScale(). if no ParticleRep object exists, we return the default values. Definition at line 996 of file Particle.h. Set the 3-momentum of this particle. The energy is set to be consistent with the mass. Definition at line 296 of file Particle.h. References ThePEG::Lorentz5Vector< Value >::rescaleEnergy(), ThePEG::LorentzVector< Value >::setVect(), and theMomentum. Set the life length of this particle. The life time will be automatically rescaled to be consistent with the invariant distance. Definition at line 462 of file Particle.h. References rep(), ThePEG::Lorentz5Vector< Value >::rescaleEnergy(), ThePEG::LorentzVector< Value >::setVect(), and ThePEG::Particle::ParticleRep::theLifeLength. The invariant distance may become inconsistent. Definition at line 471 of file Particle.h. Set the momentum of this particle. Afterwards, the underlying Lorentz5Momentum may have inconsistent mass. Definition at line 305 of file Particle.h. Return a set of neighboring particles coming from the same decay as this one. The return value is a newly recalculated set every time. It must be stored to be used further, do not directly call e.g. siblings().begin() or siblings().end()! Definition at line 409 of file Particle.h. References hasRep(), labVertex(), rep(), and ThePEG::Particle::ParticleRep::theVertex. Definition at line 90 of file Particle.h. Definition at line 88 of file Particle.h. ParticleData needs to be a friend. Definition at line 96 of file Particle.h. Definition at line 92 of file Particle.h. Definition at line 94 of file Particle.h. Specify how to print particles. The format string is analogous to the one used by eg. the unix 'date' command as described above. Definition at line 931 of file Particle.h.